Do you think you might want to go to medical school in the future? Are you wondering what you can do now to prepare and enhance your chances of gaining admission? It's never too early to start thinking about your career goals and planning how to achieve them. The high school years are the perfect time to begin exploring your interests and preparing your background. Take advantage of the resources available at your school and in your local community to begin your preparation for a medical career. Why is it important to start early if you want to become a doctor? First, you will need to attend a college that will prepare you for medical school. This means a competitive college or university that offers the science classes you will need for acceptance into medical school. You will need to take the appropriate classes in high school to increase your chances of being accepted at the undergraduate institution of your choice. In addition to your coursework, undergraduate admissions and medical school admissions will consider your extracurricular activities. The more relevant experience you have, the stronger a candidate you will be. That experience will also help you figure out if you are sure that you are interested in a medical career because you will be exposed to what it's really like to be a doctor. Visit your high school guidance office and ask about resources for learning about medical careers. Tap online resources such as the Occupational Outlook Handbook. Meet with medical practitioners in your area and through family and friends for informational interviews. Ask them what it takes to be a doctor and inquire about the challenges and satisfactions involved with their work. Ask any contact with whom you have developed a nice rapport if you can shadow them as they go through their day. These observations will help you evaluate your comfort with medical environments and interventions. Consider volunteering at a local hospital, nursing home, or other health-care establishment. Medical schools look for proof of your exposure to medical settings and commitment to serving others. Find a part-time or summer job at a health-care facility. The more experience you gain, the better equipped you will be for medical school. Once you are 16 (age varies by state), you may want to complete training during the summer to be a certified Nurse Assistant (CNA). Training takes anywhere from three weeks to three months. Once you have your certificate, you can earn good money and gain valuable experience prior to medical school. Another route to consider is completing training as an emergency Medical Technician (EMT) once you are 18. Basic level EMTs can complete training in as little as two to three months, and they play an important role by intervening in emergency medical situations. Develop a strong background in science and prove that you can handle rigorous courses in biology, chemistry, physics, and math. Take AP and advanced courses as often as possible and maintain high grades. Meet with your guidance counselor to plot the appropriate high school courses. Reach out to local medical researchers and volunteer to help them carry out their research activities. Ask your science teachers, family physician, and other contacts to recommend researchers. Medicine is a research-based discipline, and schools will value evidence that you are research oriented. Take on leadership roles at your school and in your community. Prove that you can motivate your peers to action, particularly in ways that benefit your school or community. Make sure that you conduct your life in accordance with the highest ethical standards. Medical schools and the medical profession demand that candidates conform to very high ethical standards. Carefully research four-year colleges in collaboration with your high school guidance counselor. Identify highly regarded schools and find out how many of their grads are accepted to medical school. By starting early and taking some of these steps, you will confirm your interest in medicine and prove to medical schools that you have the right stuff to succeed! 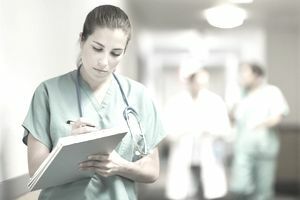 Review a list of skills you will acquire if you decide to major in medicine.